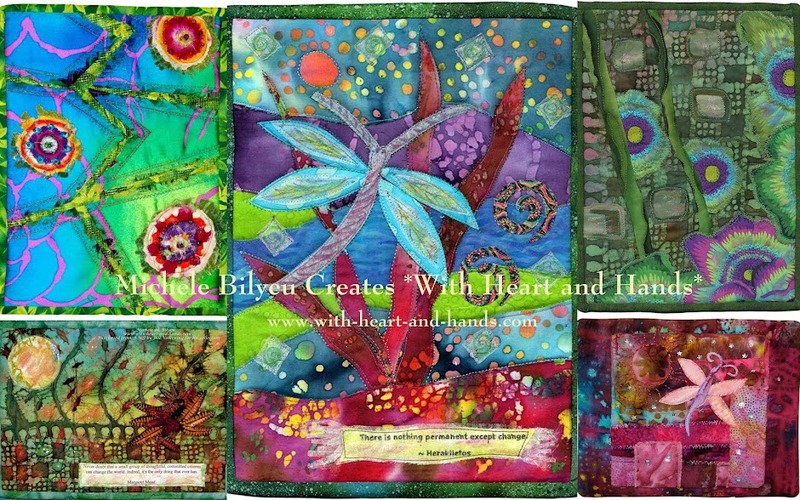 Michele Bilyeu Creates *With Heart and Hands*: Ties That Bind Give Away Continues! Ties That Bind Give Away Continues! The Blog Hop Tour of Marie Bostwick's newest novel Ties that Bind may be over, but entries for the drawing of two free copies of the book, a mug mat, and other goodies continues here on my blog through May 2nd. Just leave a comment on my last post to be entered automatically into the drawing. 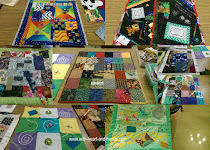 Michele Foster of the Quilting Gallery invited 10 of us to participate in the book's preview and Blog Hop Tour..two of us each day..and asked us to write about our first and/or favorite baby quilts we each had made. I love making baby quilts and have probably made hundreds of them since I first began quilting in the early ’70′s! A baby quilt is not only the perfect way to learn to sew, as well as to quilt, but it makes the perfect gift for a new, or expectant mom. They are my ‘go to’ baby gift, and they have been huge hits at baby showers, and as gifts for friends and relatives. I also make and donate baby quilts to a local hospital that makes sure every premature baby has a home made quilt of their own on top of each of their nursery isolettes. And I have made baby quilts for donation to a variety of child support, and church groups who have brought my little quilts on mission trips to survivors of Hurricanes Katrina and Rita, the earthquakes in Haiti and Japan, to victims of the Australian bush fires, and to several orphanages in Africa. 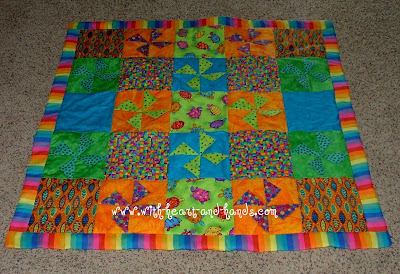 My favorite baby quilts are always made in bright colors. I especially loved my very first 3D baby quilt. Its three dimensional pinwheels made for a fun playing surface for a little one and was donated to a young mother in a local group home who was expecting her first child. But I also loved my first baby string quilt with free cut and appliqued flower shapes. It was donated to to a local child abuse prevention center. Both of these quilts symbolize my own feelings about the making, and the giving of gifts from the heart. In Marie Bostwick's newest novel Ties that Bind her newest character, Phillipa (who is also called Pippa, but was originally thought to be a Phillip, sight unseen ;) decides to get to know her new community a bit better by taking a class at the Cobbled Court Quilts Shop. She chooses a class in baby quilts. And while I taught myself to both sew and quilt..just by trying, and later by actually finding a book on quilting.. Phillipa's choice is an excellent one..she had a teacher, the help and friendships of others, and a darling quilt shop to work in! And let's face it...nothing is better than a small baby quilt made with love…for a fresh start, and a brand new life! To win a free copy of Marie Bostwick's newest novel Ties that Bind, just leave a comment on my last Blog Hop post. A comment by any of you wins the publisher's brand new copy of the book! 1. wins my own advance copy of this book. 2. plus my little mug rug shown above. 3. plus some secret extra gifts for being so extra nice! Enter Drawing on Previous Blog Hop Tour Comments: Click Here! Comments are open until May 2, 2012 for the drawing and the Give Aways. Anonymous readers may comment,just leave email addy info, here, or mail them to me, and if you are an anonymous follower and want your name in the extra drawing...let me know in your comment! Michelle, as a person who does a lot of pro bono quilts I really admire what you are doing. The quilts you show are wonderful--fun and bright. The need is great but we do what we can, right? Your baby quilts are so cute. The bright colors make me so happy, imagine a baby! Love what you do. Thanks for the drawing! Will go there next. Such darling quilts, and such a good place for them. We have something like that here in Walla Walla for kids in hospitals, not sure about babies except for a wonderful man who crochets little hats for the newborns since he retired. What you do is super. Your quilt are beautiful!Thanks for hosting a giveaway! That book certainly sounds interesting. 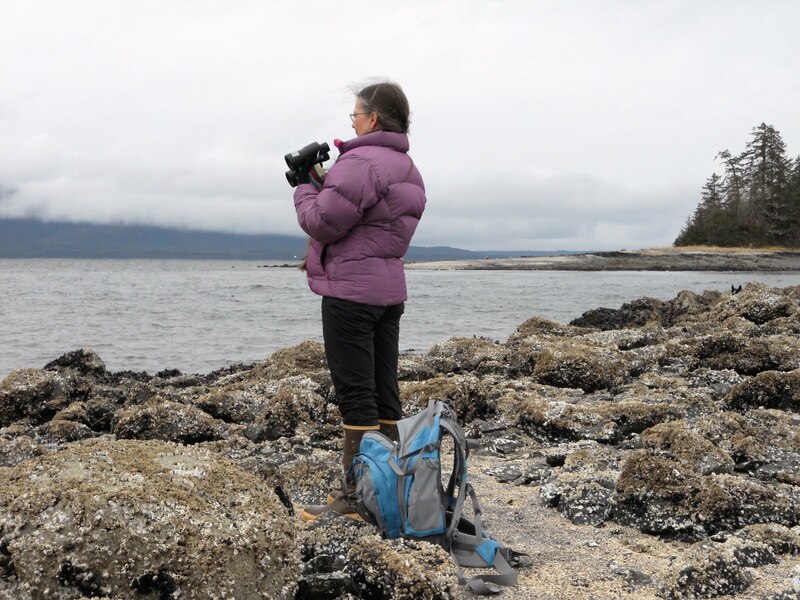 Both of your quilts are colourful and fun. The quilts are awesome and it's awesome that you share them. :) I think too, your giveaway is pretty awesome.